Chris is 39 years old and has been married to his wife Laurie for 15 years. 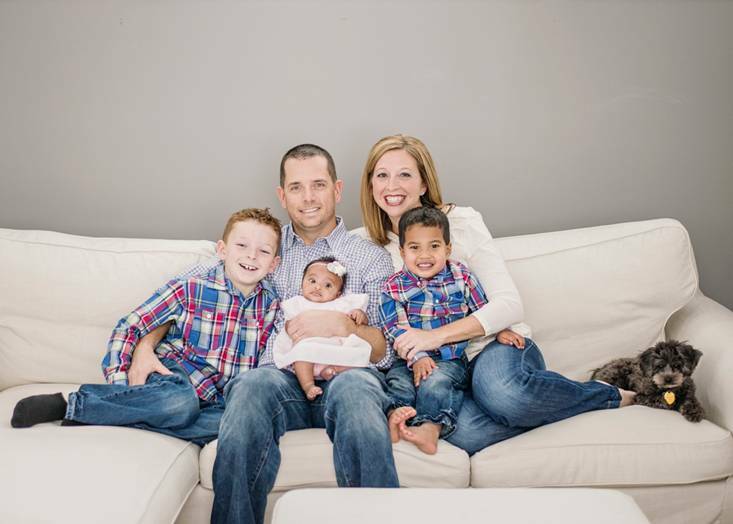 They have three young children; Chase (8) and in the 2nd grade, Rickson (2) and Alani (infant) who was just adopted this past September right before Chris became sick. Chris has worked for the Cincinnati Reds the past 15 years and was recently diagnosed with Myelodysplastic Syndrome (MDS), a rare form of blood cancer. His only cure is a bone marrow transplant. Presently, no donors in the bone marrow registry match Chris. A match must be found to save his life. Without it, his wife and children will lose him to this battle. Chris and others need a matching Tissue Type…not a blood type match. Seriously, everyone, this is so important in our community! Ronnie donated a kidney to his brother last year and saved his life. Seriously, if you can do it, please step up and do so. I’m registered. Saving a life is worth so much more than a little bit of discomfort. Be the match, donate life. My cousin’s son was diagnosed with leukemia in June, 2011. He spent over 9 months in the hospital. He underwent numerous chemo treatments & procedures to keep a fungal infection from reaching his brain & eyes. Finally, they got him to the point where he received a stem cell transplant from his older brother’ blood. He is just over 200 days past the transplant and is doing great. He’s back at UC finishing his classes. He was a four year swimmer for the Cincinnati Bearcats team. He is a living, walking, talking example of how valuable transplants can be. Bless you, Dallas, for posting such a valuable article. I’m registered. Had a coworker who’s nephew needed a donor. I wasn’t a match but I am ready to go if someone needs it! I wish I lived closer and was old enough! I would go through temporary pain to save a life in a heartbeat!!! Please people- SAVE A LIFE!!!! Do you know if there is a way us Louisville based Reds fans can check to see if we are a match? Yes, log onto marrow.org and follow the steps to join. they will send you a swab package in the mail (no cost) and then you mail it back in. Please help save our friend and co-worker! tell you friends! Chris is my son in law. Thank you for posting this ! This is the same cancer Robin Roberts from GMA is battling. I’ve been in the registry for years now. Super easy but the 5 min. It takes to read the instructions, swab your cheek & mail it out can REALLY make a difference in ( as in save) someone’s life! I am getting registered this weekend. Chris and I went to college together. Their family is in my prayers daily. Thank you for this blog. Once again its time for our Ace Starter, Mat, to appear and shut the door on the Pirates. He has been phenominal and I hope he gets the win. Keep trucking to you both!!! bill/Go Reds! !